The Stihl MS201 C-M 12" Chainsaw is a very lightweight, professional chainsaw for pruning and de-limbing work. M-Tronic is fitted as standard to ensure optimum engine performance at all times and easy starting. It also has a captive nut on the sprocket cover and a 3/8" saw chain for high cutting performance. Economical 2-MIX Engine. Combi lever - As M-Tronic has electronic cold and warm start recognition, only one start position is needed on the combi lever. The exact amount of fuel is supplied on demand. You do not need to know about the status of your chainsaw and can apply full throttle straight away - even with a cold start. Because the saw is warmed up by optimum acceleration in a few seconds. STIHL M-Tronic (M) - This fully electronic engine management system adjusts ignition timing and fuel metering in all operating modes. It also takes external conditions such as temperature, altitude and fuel quality into account. It ensures consistent engine performance, a constant maximum speed and superb acceleration. M-Tronic makes manual carburettor adjustments unnecessary. Thanks to electronic cold/warm start recognition, now there is only one start position on the combi-lever. The engine starts after fewer pulls and with no change of position, and can immediately accelerate up to speed - even after a cold start. M-Tronic also remembers the settings from the last time the tool was used. So when external conditions are the same, optimal engine performance is available every time you start up again. Advanced combustion technology - Four overflow channels swirl the fuel-air mix before ignition, allowing for optimum combustion and highly efficient performance. The result is lower fuel consumption and high torque across a broad rpm range. Compensator - This controller in the carburettor prevents the fuel-air mixture getting richer as the air filter becomes clogged. The correct quantity of fuel is delivered to the carburettor depending on the quantity of air passing through the air filter. This keeps the fuel/air ratio in the combustion mixture constant and hence also the engine power. The filter doesn't need to be cleaned until an appreciable drop in power occurs. Captive nuts - When changing the cutting attachment, you will not risk losing the nuts on the sprocket. Side chain tensioner - The tensioning screw can be found on the side of the chain saw through the sprocket cover. This removes the need for contact with the sharp saw chain. 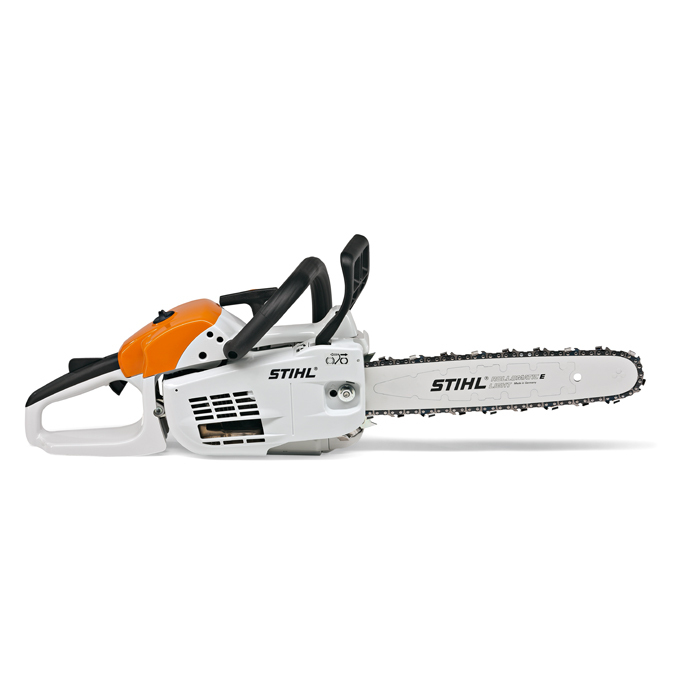 STIHL ElastoStart - STIHL ElastoStart reduces the shock caused by the compression of the engine during starting. The compression shock is taken away from the user's joints and muscles through a spring or rubber element in the starter handle.